Upon hearing the air conditioner is going to need some major repairs, a friend's father took a fall recently and is not so happy with his life, the garment industry (of which I'm ashamedly a part of) takes woeful advantage of overseas workers, then dropping a box filled to the brim with Size D batteries and watching them roll all over the floor, I noticed I wanted to sit down and weep. I'm grateful today for cold front that moved in yesterday and the mild breeze that wafts through my open windows. Just when I thought my only option for today was to go back to bed and take a nap, I came across this video on FB. Not much cuter than a piglet playing in a mudhole. Enjoy. I noticed that I sometimes treat people (like Sweeite) exactly the way I hate to be treated. For me not knowing something that other's think is basic stuff is quite embarrasing. Being called on it even worse. That person thinking I'm a big dummy, and stomping around to prove a point, even worse. I also noticed that in my own righteousness, a person's belief that (s)he is right and I am wrong messes with my head. I begin to doubt myself, to back step, to crawl off my pedastal. Cause it's pretty embarrassing to think you're right, then be wrong. I guess the answer is treating others the way you want to be treated. And treat yourself like you'd like others to treat you. Now there's an idea that sounds golden. I'm not very good at keeping secrets. Partly because I forget something is a secret to begin with. And partly because I get so excited about surprises. That's the reason I'm not one of those buy all year long for Christmas kind of people. When I buy it, I want to give it right away, not hold on to it for the holiday. Recently I had this idea. A surprise for someone. I was about to pop so I shared the surprise with someone else who said, I can help with that. That's when I noticed that the small surprise had turned into a quadruple surprise. Cause when I sent the surprise to my friend, she had the fun of opening the box and seeing the surprise. She worked on it for a few days. We traded emails and a couple of photos. When it was done, I had the fun of seeing it finished before it was mailed. I just got an email that the surprise is on it's way to the person who will give it to the it was intended for in the first place. I'm all a-twitter with excitement. I want to spill the beans. I want to say wait til you see the surprise. But this time, I want the next two people that see the surprise to be really surprised. Surprised beyond the normal, everyday surprise. Like finding a diamond ring on the sidewalk, or looking up at the night sky and seeing a meteor shower, or seeing your baby's little toes for the first time - that kind of over the moon surprise. I'm having a hard time waiting for news that the surprise has been delivered. Please don't try to get me to tell you what the surprise is because it's a secret. Sweetie and I took his granddaughter to dinner last week. She's finished her first year of college and had enough of the America's Oldest City. She's a small town Northern girl, not too enamored of a tourist town, or a college that doesn't allow refrigerators in dorm rooms. In the conversation, Sweetie asked her what she likes to do. She whipped out her phone and showed us a couple of her doodling pictures. I noticed that doodling, like so many other things, has come a long way from the flowers that I draw over and over while put on a telephone hold. A couple days later I saw this picture on a quilting FB site. Instead of doodles it a way of stitching Zentangle®. 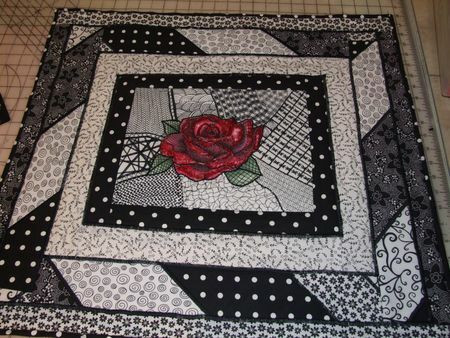 It's like a black and quite crazy quilt. I like it. I think I see some doodling in my future. How about you? Doodled lately? When my father and mother were alive they used to sit in the same church pew week after week. About four rows back, the one with a small nick in the wood. I don't know how they decided on that particular pew or how many years they sat there. After Dad started using a walker, then a wheelchair, we moved to the first pew so the extra equipment wouldn't be in the way of people carrying crosses and torches. I kept that spot until after my sister moved. Then I moved into the back. I like the view. Today I noticed that there was only one child in church. He was most noticeable because of how well behaved he was. Maybe 5 or 6 years old, he sat quietly, no fidgeting. Before the offering I asked him if he'd like to help me pass "the little churches," typically a special offering that began as a fund for children. When asked, he told me his name was Kyle. He took my hand and didn't hesitate to follow me, a stranger. Not shy at all, he said a quiet hello to each person we passed. When it came time to pass the churches around, he was a natural - an acolyte in the making. At one point I looked at his face. I couldn't help but notice the depth of his brown eyes, or his gentle spirit. When he smiled, I knew I was looking at the face of God. I am embarrassed to say that I could not pull myself away from the TV's coverage of last week's manhunt. I asked myself what it was I expected to see. A gunfight? Mob rule? Blood? Vindication?Every time they flashed a picture of the guy they were looking for, I closed my eyes. It was hard for me to wrap my head around everything that had happened and tie it to that face. Unlike other crazy, mixed up, "terrorists," I didn't think the younger brother had the face of evil, tho the act itself was hellish. Where is God people ask when horrible things happen. How can light and love be so hard to find when horrible things happen? Maybe it's because we're so shocked and traumatized we forget to look. Or maybe it's because the frantic talking heads don't think the light is as important as the gore. "Look for the helpers" a blog friend told me. I did. And it was in there I found God amongst the rubble. He was the hands of the first responders, the people who ran towards the mayhem, not away from it. He was the courage of the policemen. He was the twitters that told loved ones miles away that "I'm okay." He was the eyes and ears of people locked in their homes who knew to stay put. He was the love that reached out in the form of blood donations, financial gifts, and prayers. He was Sweetie holding me. He was rain pouring down as if to wash away the fear. He was the cookie(s), the hot shower and the clean sheets that brought me comfort. He was the music and the words I heard in church today. A reminder that greener pastures exist and each of our cups does run over. He was Kyle's small hand in mine, the promise of a brighter tomorrow. He was the quiet voice, that whispered "do not be afraid, for I am with you." As I waited for the valet to bring my car down from the parking garage, I noticed 2 magnolia blossoms on the tree across the street. Enticed like those cartoon characters that are carried forward by the whiff of some great smell, I walked over, put my nose in one, and sniffed. Oh my! Oh my. What a fresh clean, after the rain, sweet, southern smell. This afternoon as I was pulling out of the driveway to go to work, I noticed how pretty and green our front lawn looks. I still haven't gotten used to the lack of trees. My little maple tree needs some friends. Johnson's to the point in sidewalk making where he has to wait for a really big storm to see if the drain works before he adds one more piece of concrete. We need to do some landscaping, but at this stage of the game Sweetie and I haven't come an agreement on the final vision. He mentioned something about using hay instead of mulch. I said something along the lines of, HELL NO. Thus we're at a standstill. If we don't hurry up, it's going to be way too hot to play in the dirt. Unless, of course, we were dogs. Suzi Q learned soon after we got her that a whole behind the hedge is one of the coolest spots around. When Maizey arrived on the scene, she said, "let's forget the hedge, and just dig right in the yard. Suzi thought about it for about a minute, then joined right in .... until she saw the camera. Stick. Stick. Who's got the stick? Every time I see these pictures, I notice how these crazy, poorly-trained, hole-diggin' dogs melt my heart. May we all sleep peacefully tonight, especially people in Boston. Sweetie and I drove downtown yesterday to hear some teenagers who have aged out of "the system". Kids who, at 20, have turned their lives around. Imagine, instead of just setting out on adulthood, they are picking up the pieces of a what was supposed to be a childhood. Their stories made me sad for their past, glad for their future, and really angry at a system that has gone so far astray. On the way there, while Sweetie was looking for a parking place I noticed some bright colors wrapped around a tree. So after Sweetie went into the office to do some business, I walked back down the street. My first thought was a homeless person had wrapped his blanket around the tree. But when I got closer I could tell it was kind of art project. There's a big thing in town this weekend. Artists/entrepreneurs/innovators all vying for a quarter of a million dollar prize. I don't know all the details. People get to vote for the idea they like best and at the end of the weekend, the best idea wins. I'm guess there will be all kinds of worthy causes. The decision won't be an easy one. Even though I don't know what the purpose of an afghaned tree, or sweatered bike rack is, but I quite like sight of it. Maybe if I'd seen them after the family services presentation, instead of before, I'd have felt better going home. I've just been to the One Spark website. There's going to be a whole lot more going on than I imagined. I think I've got my weekend planned. Check it out. If you had a creative idea to share, what would it be? How awful it feels to hurt someone's feelings, especially someone you love, even if you didn't mean to do it. When I'm depressed I have a strong desire to get lost someplace where I can be alone and I don't have to think about anything, just wander. A book store. A fabric store. A card store. A plant store. This wandering often leads to spending money I don't have on things I don't need. When the luster of stepping into the Messiah's shoes wears off, trying to save people is hard work. When I look in the mirror I see a person who isn't smiling. There is an art to self-portraiture that I don't have. Even though I've read Magic 8 Ball, more times than I can count, seeing it in print, in an actual magazine as opposed to on-line, made me feel very proud. I read it again, as if it were the first time. Seeing little sunflower shoots pop out of the dirt and start to follow the sun while still wearing their seed coat, is like watching a magician pull a rabbit from a hat. My anger meter seems to be set on high. It doesn't take much to piss me off. That usually makes me cry. It could be part of that compound grief stuff, or maybe I'm just extra pissy. People at the end of their life have a story to tell. We should all be asking questions and listening to the tales of love, adventure, heartache, pain, marriage, divorce, getting a private pilot's license, hopes, dreams, and on and on. Tonight I noticed how quickly my stomach goes into anxiety mode. Actually, I've been there a few times in the last week. And, to be honest, perhaps part of the dyspesia was all the fresh, hot, delicious bread and real butter I ate at the Columbia House in St. Augustine. We were celebrating Sweetie's birthday and saying goodbye to his granddaughter who is finishing up her year at Flager College. Seriously folks, if you're ever in St. Augustine you've got to stop in at this restuarant for bread, black beans if you go for that kind of thing, and their 1905 Salad. It was a good night. We had no idea what had happened in Boston. I'm having trouble dealing with stuff like this. Hiding under the covers is looking better and better. However, I was reminded by my friend Sorrow that if you watch the news with the sound off, you'll see people running into harm's way to help. God bless people like that. No matter where you are tonight, I ask you to be the change you'd like to see in the world. Brave words from Chicken Little. But you know the old saying, fake it til you make it. Wishing you peace. Pass it on. Yesterday I noticed that a baby's smile can make me weak in the knees and keep my sadness at bay. It's time to quit trying to conserve energy and turn on the A/C. How cute little fuzzy puppies are. I should have played in the dirt before the temperatures reached into the 80's. A butterfly flitting around the front yard. Since all Monarchs look alike, I don't know for sure, but I like to think it's our child coming home for a visit. Today I'm noticing how sad I feel. I just read that a blog friend's mother died last Sunday. That on the heels of hearing 2 other people I care about have lost a parent. All lived long, full lives. There will come a day when that clumsy phrase penetrates the grief. For me, news of a parent's death taps into a sore spot in my heart. I feel sad, tired, and, in an odd way, lonely. If it's true bad things come in threes, then the string of deaths must be over. Hopefully I'll have some time to regroup. That's the problem with my grief, like the ocean's tide continually returning to the shore, it keeps coming back. Sometimes in a slow gentle wave, sometimes like a tsunami. I looked for the root of that axiom on Google, but found very little. I did find, however, that things that come in threes are supposedly funnier, more satisfying or more effective than other numbers of things. I didn't know this was a "writing principle," but I tend to write this way (see string of adjectives above). It sort of flies in the face of my writing coach's advice to say something once and leave it. "Looking for threes makes it a lot more likely that we’ll notice thing in groups of three." Things happen. People die. My job is to find the grace in death. To feel gratitude for the time I shared. To savor the memories. Bad things may come in threes. A series of three adjectives may be funnier than just one. But there is also a Latin phrase "omne trium perfectum" that means everything that comes in threes is perfect, or complete. Here's to hoping this series of death is complete. I called Apple tech Services last week. I was convinced to upgrade my operating system. "It's pretty much the same," said the nice young man on the other end of the line. "Plus you'll get three months free service, so if you can't figure something out, all you have to do is call back." He was right. Mountain Lion is pretty much the same as Snow Leopard. And really the things that I've noticed are different are not reasons to go to GQ (General Quarters for all you un-military people). However, it's the little things that are driving me nuts. For instance: I noticed in order to scroll down, I have to move the screen up. I noticed the blogs on my Top Sites used to get a star by them when something new was posted. Now there is no indication whatsoever that makes today's post different from yesterdays, even though there it is probably brand new. Would somebody please tell me why it's necessary to "upgrade" something that is working just fine? I also noticed that having one of my sisters visit is like being a part of a family again. Even if we're just sitting on the couch watching a movie we've both seen before, I like the comfortableness of it. I (re)noticed that when I'm working with fabric, I really don't care much about anything else. It's easy to bury my emotions with a mountain of fabric and a pair of scissors. It's a beautiful day in my neighborhood. What have you noticed in yours? I noticed tonight how much alike it is rubbing lotion on Bella and Miss Mary after their bath. I think it soothes both of them. I realized it soothes me too. That healing thing about touch, it works both ways. Today I noticed a strong desire to help someone I don't even know. Before you read this please hop over to my friend's blog and read what she has to say about money, or lack of, the value of a person's talent, and how you can't put a value on some things, like a smile. Go ahead, I'll be here when you get back. Okay, so now you have a little bit of an idea of where I'm coming from. I read a similar story this morning, (see below) and felt sad for Mitchell and frustrated that I don't have the kind of bank account that let's me write a check to help. I would be the first person to say, every little bit helps, that I don't have to do it alone. In fact, the more people who donate the more people will have that happy feeling you get in your heart when you lend a hand to someone in need. To tag on to Luminary's idea of making something that someone will buy so the money can go towards getting Regan a new smile, I'm going to offer up the Christmas quilt I made last year and put away because who wants a Christmas quilt in April? I'll do the same thing I did on my last quilt give-away. You make a donation, then leave a comment on here on my blog. I'll put all the commenters names in a hat and choose one who will get the quilt. I'd really like the donations to go to the Southwest Indian Foundation, for Mitchell's house. But if you want to help Regan get his teeth fixed or you want to donate to a homeless (since both these men are/have been homeless) shelter in your neck of the woods, that's fine too. I don't need to know how much, but I would like to know where the donations go. Since tax day is right around the corner, and you may be having to dip into your pocket I'll set a date of May 15. Plus that's far enough away if you donate/comment right away, you'll forget about it and then if your name gets chosen, it will be a big surprise! I like those kind of surprises! Like the 100 dollar bill I found last week. Egads! Don't look at my mess night table. Here's the quilt. It's 66 inches square, pieced by me, machine quilted by Joyce Snyder. 100% cotton fabric, machine washable and dryable. As you see, it's alread got Girl Cat's seal of approval. So here is Mitchell's story. I hope you'll be moved the way I was. Mitchell is homeless. He lives on the streets of Gallup, New Mexico. Mitchell is totally unique. Of course, we could say that about any person we may find living on the street. In the case of Mitchell though, he does not fit any description I have ever known. I had never met Mitchell until about 3 months ago, given that I am from Crownpoint and have not spent much time on the streets of Gallup New Mexico. Recently, I have been spending more time in Gallup, working at the soup kitchen and working with the project office at the SouthWest Indian Foundation. My first knowledge of Mitchell was when a very good woman who runs one of the town laundry mats came into our office. I could overhear her talking about this gentle homeless man who was beaten up last night because he was protecting one of her lady patrons who was taking her laundry to her car. I heard a story that during the winter chill we had about 5 weeks ago, he built a "lean to" for an elderly homeless woman out of cardboard and rags behind a tunnel to keep her out of the wind. He made a special trip to find her food and water during a snow storm. In some ways, Mitchell is the stuff of which heroes are made. Why he is on the street is a complicated question. I only wish you could see his smile and his eyes sparkle. It would be easy to understand why he may be bitter or even demented but the opposite is true. I have seen him beam with joy over the smallest little pleasure. I handed him a tortilla one morning and I saw his eyes well up with goodness. To sum it up, Mitchell is a good man, with a pure heart.I am really worried about Mitchell's feet. His frost bite from this last winter had gotten worse. His feet almost have no circulation at all. My Doctor examined Mitchell last week for us. The doctor doubts Mitchell will last another winter.So, what is to be done? Very simply, Mitchell will not take "charity". He wants "earn his keep" (his words). He picks up trash and cans all over town during the day. He made an attempt to contract with the City to be an informal "garbage collector". He does not want a hand out. Although the poorest of the poor, he has a dignity. It turns out, Mitchell and I have a mutual friend who has a piece of property on the edge of town. Our friend offered to let Mitchell place a small one room structure on his property. This is a an ideal solution. We can build this modest structure and we can provide Mitchell a new home for a very modest price. I have penciled out the numbers. We can do everything needed to provide this home for Mitchell for under $6,700. He wants a very small simple place. He wants to help with the construction and pledges to continue cleaning up Gallup and the surrounding area.I am so motivated now. I am almost certain that if we do not act now. Mitchell will not be with us this time next year. I am coming to you with an open heart and open hand. Thanking you in advance for sharing what you can. If you don't have the $$$ to donate, perhaps you can say a prayer for the men I've mentioned or volunteer somewhere that could use an extra hand. I meant to write this yesterday but got sidetracked. That happens a lot! I had great plans to get up and get moving. I wanted to clean some around here, then do some work at Mary's before we went to the doctor in the afternoon. Let's just say I didn't jump right out of bed when the sun came up, so my day's start was pushed back a couple of hours. When I opened my computer I had a message that a man from church had died. I knew it was going to happen. He's been in hospice for a couple of months. I'm glad to say I visited him twice recently, and both times he was alert enough to recognize me and smile. I feel like I did everything right, although I wish I'd started visiting before he was dying. I learned a lot about him from some of the pictures his son had compiled. He had been a B17 pilot over Germany in WWII. I noticed, too late, that by not asking my elders to tell me their story(s) I've missed a lot. I suggest if you know an old person, don't just say, how are you today. Ask them to tell you about their life. It's one of the things I've enjoyed about being with Mary. I never know when she's going to open herself up and share another piece of herself with me. I feel honored everytime she does. Learning of Phil's death knocked the wind out of me. It made me sad. It reminded me of those last hours with Dad. I felt like giving up on the day and just going back to bed. "The world is just too messy," I told Sweetie. Later on after waiting an hour to see the doctor, as I was helping a very tired "old lady" to the elevator I heard the music come over the hospital intercom system that signifies a baby had been born. One life ends. One begins. It is the circle of life. The way the Creator planned it. As the elvator doors opened, I noticed a feeling of gratitude washing over me. So I said a prayer of thanks. For Phil and for the baby. Today I noticed how sweet it feels to push a baby stroller, even though Miss Bella did not follow any of her schedule while I was on duty. It's like the baby knows when I'm there and decides she's going to change things up a bit. She didn't sleep when she was supposed to sleep, or eat when she was supposed to eat. Seriously, I wonder why they even ask me to come back. Today I was very aware of how writing can be both exhilerating and defeating at the same time. I spent 2 painful days working on a story that was not turning out like I wanted it. I noticed how often I told myself, "I can't do this" or "I'm no writer." It helped to go back, just one day and see my published story in Sasee Magazine - proof that I can do it and I am a writer. Probably the only thing worse than getting the bones of a story down, is the process of re-writing. Then again, it's kind of a mystery where it's going to end up. Thanks to all of you who read Magic 8 Ball and left me comments here and on FB. Every writer should have a cheering squad like I have. P.S. Susan Buchanan. We've got to find Genie's Naval Academy story. The theme for the June issue of Sasee is "Belle of the Ball." The deadline is April 15th. I'm going to look through Dad's boxes again. Wouldn't that be cool to have it accepted? I've been trying to write a story about my horseback riding adventure. After it turned midnight on the East Coast, when most sane people are in bed, even crazy writers, I decided to check to see if the April issue of Sasee Magazine is out. And just in case you can't hear me tooting my own horn wherever you are, you should know I'm pretty excited. I noticed, even though I knew it was coming, being published feels grrrr-eee-aaa-ttt! If you are so inclined, check it out at sasee.com. My story is called The Magic 8 Ball. If you like it feel free to leave a comment.